It’s hard to be brave sometimes. As I post this, our family is on the road in the midst of a move. Across the country. Site unseen by all but my husband. I won’t even lay eyes on the house until we pull up to it to move in. We still aren’t sure where the kids will go to school, I’m 6 ½ months pregnant and have no doctor lined up, and we’ll be spending Christmas amongst people we’ve only known for a couple of weeks. It’s a bit daunting, and I’m not feeling all that brave as I look ahead. The dictionary definition of “brave” is “possessing or exhibiting courage.” Franklin D. Roosevelt is attributed the following quote about courage: “Courage is not the absence of fear, but rather the assessment that something else is more important than fear.” So in our case, what is that “something else?” Faith. Faith in our heavenly Father that He has a plan for our ultimate good. My current situation reminds me of Abraham and Sarah (at that time, Abram and Sarai). God appeared to Abram and said, “Leave your country, your people and your father’s household and go to the land I will show you” (Genesis 12:1). He promises that He will make Abraham into a great nation, and just like that, “Abram left, as the Lord had told him” (12:4). Now, that took courage. And not just on Abraham’s part, but on Sarah’s as well. Imagine your husband told you God had spoken to him and told him to move the family to an unknown destination. I can’t even imagine what went through Sarah’s mind. Sure, God appears to my husband, but what about me? What assurance do I get? After all, Abram’s getting old. How does he know for sure this was God and not just some dream? And where exactly are we going, anyhow? Abraham and Sarah both must have had their private misgivings, but they went nonetheless. Why? Because their faith in God was more important than their fears. Faith requires courage, because “Faith is being sure of what we hope for and certain of what we do not see” (Hebrews 11:1). But here’s the thing- God gives us that courage and that faith as a gift. We don’t have to muster it on our own. What a relief! When Moses died and Joshua took over the daunting task of conquering the Promised Land, God gave him a pep talk of sorts. In this speech in Joshua 1, God tells him three times in the span of four verses to “be strong and courageous.” In verse 9 He gives the reason we can be courageous: “Be strong and courageous. Do not be terrified; do not be discouraged, for the Lord your God will be with you wherever you go.” God is with you no matter what you face. He is with you wherever your path leads you. Even across the country. Wow! At this time of year I would have compared you to Mary rather than Abraham and Sarah, but I assume at least you’re not riding on a donkey. 🙂 God be with you and your family! And I think how they must have had such trust…praying for your family’s move and a lovely reception to your new dwellings! 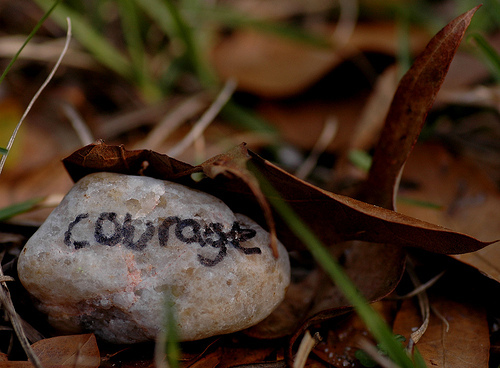 May you have the courage of all those who have lived “by faith” ahead of you. You are brave, my dear, and by sharing your situation, you will be covered in prayer.